A couple weeks ago, I found myself at a vegan restaurant pondering my dessert options. They had it all: a vegan soufflé, pie, a chocolate blackout cake, a sundae, and more. And the thing I wanted most of all was the carrot cake. It was probably the most humble, rustic dessert on the menu. And that’s why I wanted it so much. Restaurant food impresses and inspires me, but at the end of the day it’s home cooking—or food that evokes home cooking—that I really want to eat. 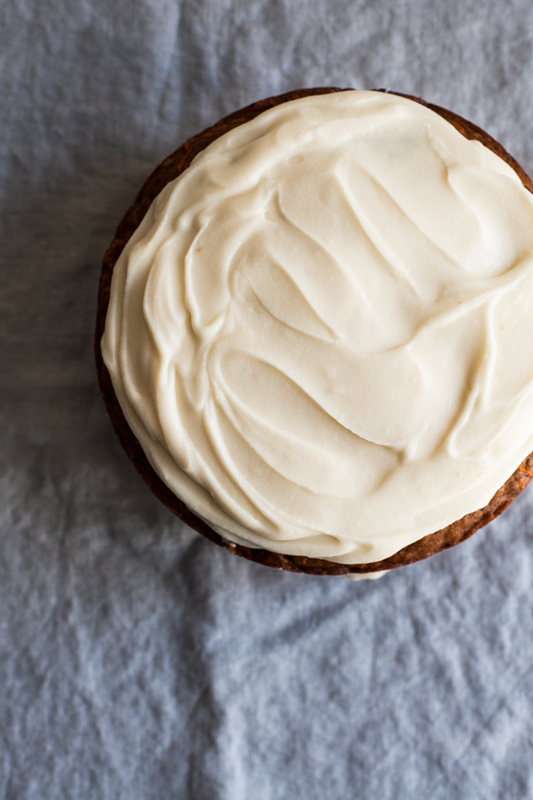 I’ve been hesitant to put a carrot cake recipe on the blog. It’s such an iconic dessert, and the few conversations I’ve had about it suggest that people have very strong opinions about the right way to do carrot cake: texture, sweetness, concentration of carrots vs. raisins vs. nuts, optimal choice of frosting, etc. In the end, I didn’t quite attempt a classic carrot cake. Inspired by the first week of truly crisp, baking-worthy fall weather (which wasn’t this week, for the record: it’s been a swamp in NYC! 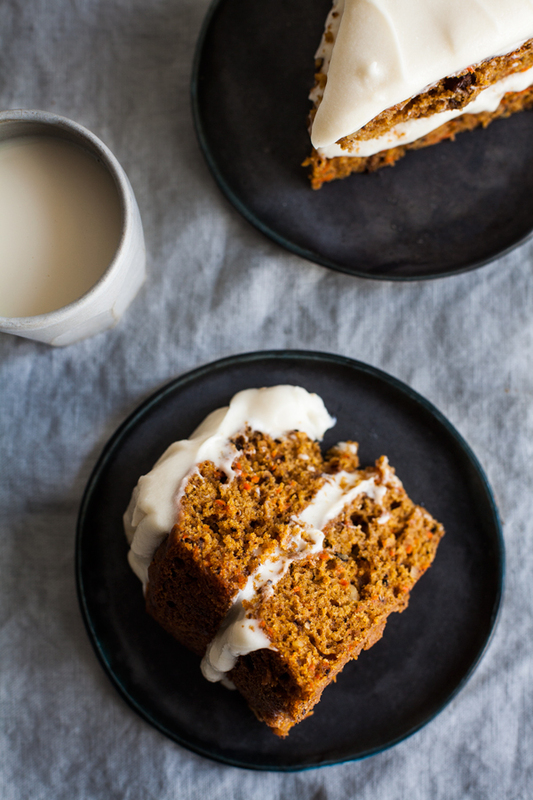 ), I decided to merge two of my favorite sweets, carrot cake and pumpkin bread. 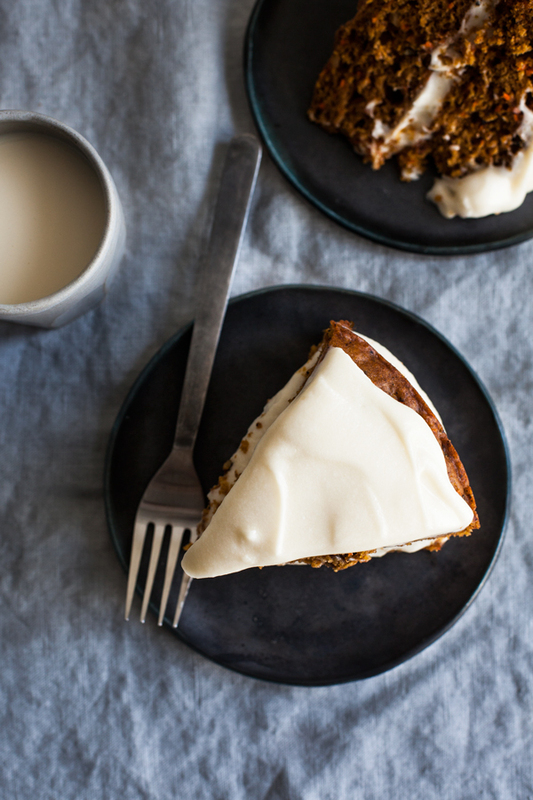 This pumpkin spice carrot cake is the very, very happy result. I can’t speak from a place of definitive carrot cake expertise, because hey, we all like what we like. 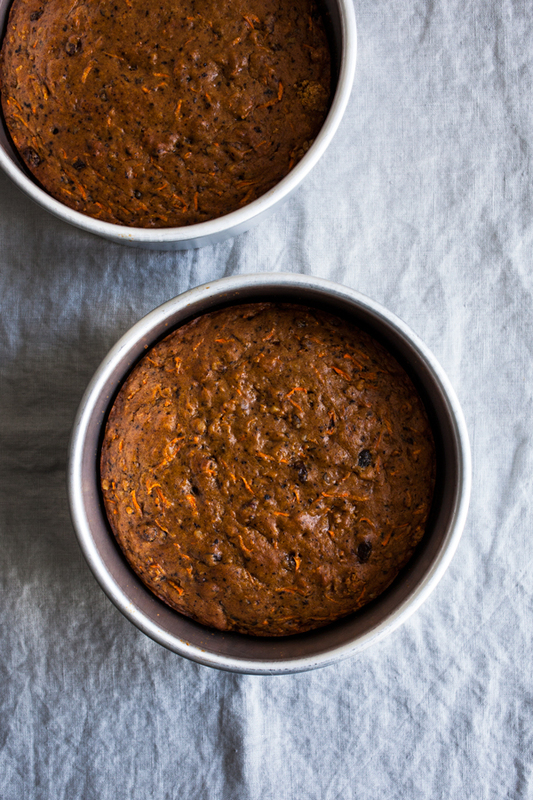 But this is my kind of carrot cake: dense, packed with juicy carrots, a little crunch from the walnuts, but not so many of them that they get in the way of a proper cake-like texture. The pumpkin adds plenty of moisture, which allowed me to use a bit less oil than most traditional recipes call for. And the spices—a mix of cinnamon, ginger, and cloves—make it especially perfect for fall. 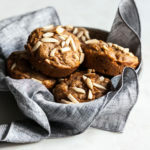 The cloves in this recipe are courtesy of the wonderful folks at Nuts.com—pretty much my go-to destination for restocking the pantry. 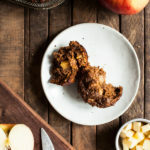 For a long time I thought about Nuts.com as being a storefront for nuts, legumes, and grains, but I didn’t think to rely on the site for spices or condiments. Now I know that the site has a huge selection of the best-quality herbs and spices, so it’s perfect for stocking up (especially for those spices I use all the time). The cloves in this recipe have a deep, distinctive flavor, and even a little pinch made the cake so much richer. Is this the most elegantly frosted cake ever? No. I didn’t even frost the sides, because I typically make a giant mess when I try to do that, and I was eager for a slice of this cake to be in my belly quickly. But if you ask me, carrot cake was meant to be homey and rustic. The frosting, by the way, is a nod to traditional carrot cake recipes, and it really is amazingly authentic. I loved cream cheese frosting as a kid, and licking the spatula after I made this batch brought me back in time. It’s rich, though, so if you prefer something lighter and less sweet, you can try my creamy cashew frosting instead! As October-friendly as this recipe is, it would make a wonderful birthday cake or anytime cake (snack cake, dessert cake, tea cake, etc.) at any time of year. I hope you’ll find it as comforting and satisfying as I have. See you soon, for another weekend roundup. This sounds wonderful. I’m guessing omitting the walnuts wouldn’t be a deal breaker? What about the raisins? Is it ok to omit those? I like raisins, but not *in* stuff, I hate them in stuff. Yes, a thousand times yes xD Carrot cake is my absolute favorite dessert. I’ve been hoping for a great recipe from you! ♡ I make your raw version from time to time, but sometimes you want the real thing 😀 Thankyou! So excited for this! 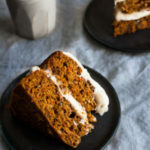 Kind-of funny reading your post about “traditional” carrot cake. I’ve been reading American Cakes, and there is a carrot cake recipe from colonial times, no cheese cake frosting, and the carrots were cooked and pureed. I am still trying to nail down a recipe for a veganized version of it. Holy yum! If the weather will only cooperate I will bake this to really start fall rocking! Looks Very delicious. Keep it up. I will Definitely try this recipe. This looks Awesome!! !Very nice cake and pictures! I can’t wait to make it! Thank you! 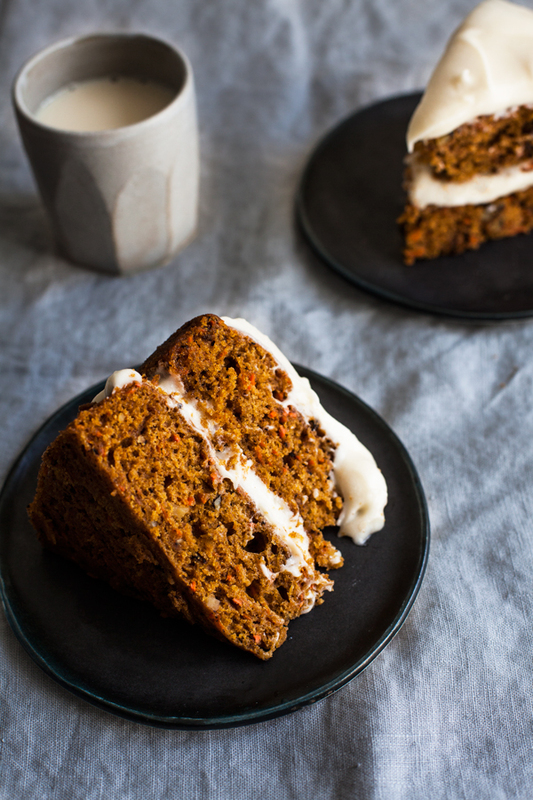 I seriously had a dream the other night about pumpkin carrot cake! And hey, classic smashic.. as long as you love it, that’s all that matters, right?! I finally came to that conclusion years ago when learning about making carrot cake… some had pineapple and/or coconut, others not, some used walnuts, others pecans…. I’ve yet to try Tofutti, but have used their sour cream! I’ll give it a go! Delicious and beautiful work Gena – love the naked cake too! Awesome. I’m going to give it a whirl with GF flour (Celiac here) and Kite Hill cream cheese, which I haven’t tried yet, but I love their yogurt. 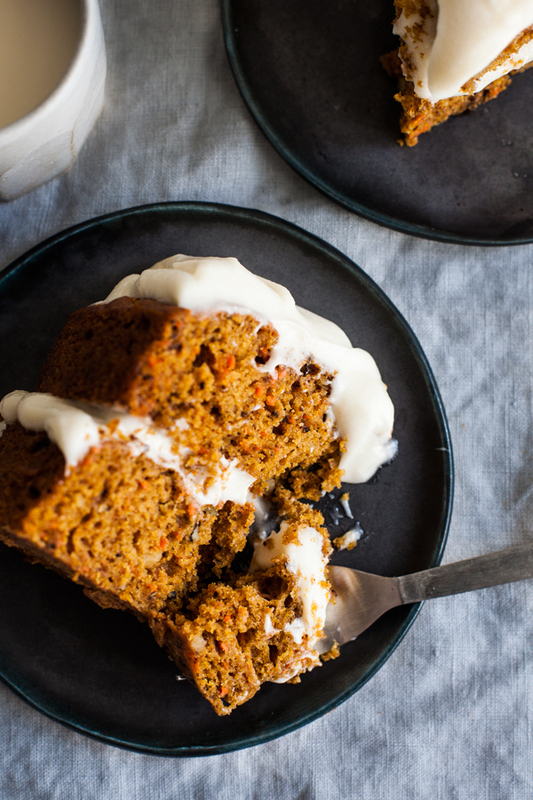 My husband LOVES carrot cake (not a fan here) and I love pumpkin, so this might be the perfect thing. Minus the walnuts, because of nut allergies. Wow, look so yummy. I will try this recipe tomorrow. Thanks so much for this post!! I love this simple yet creative toast idea Gena! It’s refreshing at the end of summer to get back to simple things, after the overwhelming amount of produce selections pair down a bit. Happy first day of fall sweet friend! This was delicious! I didn’t have white sugar so I used all brown sugar, and it turned out exactly how I like carrot cake to be! Flavors are good (I think I could’ve added even more spice), but mine is pretty dense. It was a very thick batter. Great flavour but much too dense — I think partly to blame is the amount of pumpkin puree, which even reduced to 3/4 cups was too much. I did notice most of the rising happening at the start of baking, indicating to me that there was not enough baking powder. Baking powder gives you that longer action leavening, whereas a soda reaction takes place all at once (I’m thinking somewhere between 2-3 tsp. baking powder, and 1 tsp. baking soda instead of what’s written). For muffins this is fine because they are baked less time, but with cake it doesn’t work so well. Unfortunately I would not use this recipe again. Cheers. I just tried this recipe. Full disclosure: I didn’t have all the right spices so had to make do with just cinnamon. Also, so cream cheese. Might just make a glaze with maple syrup and sugar later. Despite my omissions, this cake is delicious!!! Mine rose beautifully. I know the batter is thick, but I wonder if people that ended up with an unsavoury type of dense just overmixed their batter. Thank you for this recipe! I’ll make sure I have the right spices in stock soon. Christmas is coming too. There’s no excuse! TL;DR: Cake is delicious! Not overly sweet. Rises well if you don’t overmix your batter. Lovely! I’m honestly not sure. It’s a very dense cake and I wonder if it’ll be impossible to get out of the pan, or if it’ll hold it’s shape well. I’m sorry that’s not more helpful, but if you really need it to work, I’d follow the recipe as written. I hope you like it! This cake was insanely good! I served it to friends who were visiting me this weekend and they all loved it. I did tweak the recipe a little bit because I read the comments here first. I did 2 tsp of baking powder, about 3/4 cup of pumpkin puree (I had half of a can in fridge), and I didn’t put nuts in the batter. The result was moist, fluffy, flavorful, perfect cake! I decorated the top with pecans. I would absolutely make this again. I did the amount of baking soda the recipe called for plus 2 teaspoons of baking powder.